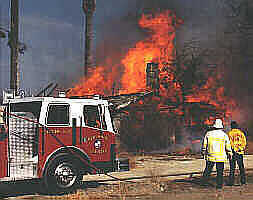 On November 8, 1995 at aproximately 12:30 pm Redlands Fire Department responded to a reported house fire at 9949 Alabama Blvd. On arrival engine company 263 found an abandoned two story house well involved and took up defensive positions. 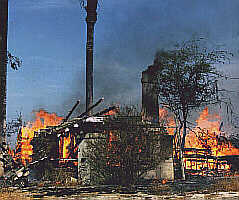 The fire was declared contained after 25 minutes. A total of 18 firefighters responded to the fire with 2 engine companies, one truck and a medic squad from the city of Redlands and one engine from the city of Loma Linda. 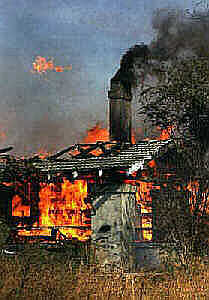 The cause of the fire in the century old house is listed as suspisious. On duty Battalion Chief Larry Egan ( wearing white helmet in picture above ) talks with Battalion Chief Mitch McKee, in front of Redlands Engine 263R on the scene of the fire.